Today brings us yet another tie offering from Express. Some will say, “only high-school kids and 20-something, bar-going hipsters get ties from Express,” but I say phooey on that. I buy most of my dress shirts from Express. First, I like their color palette, but more than that, I like their no-pocket dress shirts. As a short guy, having a breast pocket on a dress shirt doesn’t always work. On a normal size guy who stands, say, 5’10”, the breast pocket is on the breast. But on me, a guy checking in at a towering 5’5″, the breast pocket usually falls at about the bottom of the rib cage and makes me look shorter than I already am …like I’m wearing my big brothers hand-me-downs. Funny story …I once had a shirt with a breast pocket so low it was nearly tucked into the waist-band of my slacks. I also like Express shirts because they have different cuts (1MX, Modern Fit, Slim Cut, etc) to match all body types. And they sell ’em 2 for $20 sometimes. Anyway, this particular shirt-tie combo was bought as a set. The shirt is light blue with thin brown stripes. 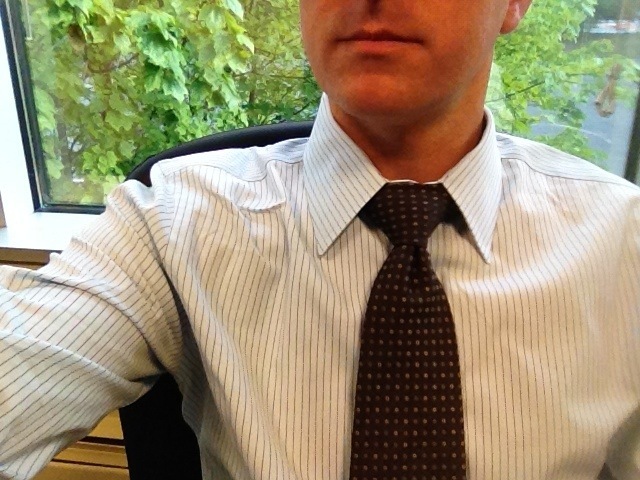 The tie has brown dots (two shades) on a brown tie. And each dot is outlined in a subtle Royal Blue which, I think, really makes the blue in the shirt (and the blue in my eyes) pop. Today I tied a Double-Windsor, hence the bigger knot. I like the perfect triangle a Double-Windsor makes and it looks good on days like this when I opt to button the shirt all the way up to the top button. 40 more ties still to come, and I’m going to start paying more attention to the backgrounds for my pictures …so you’ll get ties, a story, and hopefully a landmark or something equally as interesting as my daily tie story. Today’s background is the view out the window of our “team room.” Given that I sit a windowless cube with no sight lines of a window or daylight, I don’t mind meetings.